Finishing off 2016 with a traditional Lake Tahoe white Christmas sent us into 2017 with visions of many more powder ski days in our heads: or snowshoeing, or cross country skiing, or sledding… fill in your favorite winter activity here. You get the picture. Winter is special. Lake Tahoe Resort Hotel’s “Winter Special” with rooms from $129 a night for stays Jan. 8 through April 13, definitely ups the ante. Shhh, there is limited availability so make sure you grab your room before sharing with your friends. Now go to reservations and plan your next trip. Use the code SKI17. 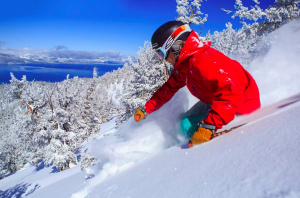 Now here’s some of the fun happening in January in South Lake Tahoe. The full moon is due to make an appearance around Jan. 14. Catch her in all her glory on a full moon snowshoe tour at the Hellman-Ehrman Mansion. State park interpreters will take you on a hike to explore the natural and cultural history around the estate and Lake Tahoe’s shoreline in Sugar Pine State Park. On Jan. 21 try your luck in Camp Richardson’s snowshoe cocktail races. This popular annual event pits racers against each other with cocktail trays in hand. The winner is the fastest through the course with the least spills. Entry is free and you can win prizes. Heavenly Village, right next door to Lake Tahoe Resort Hotel, offers quick access to the mountain via the gondola or take a spin on the outdoor ice skating rink. Heavenly Mountain Resort is also offering new thrills this winter with the Ridge Rider Mountain Coaster. Experience the thrill of this gravity-propelled mountain coaster as you race down the 3,400-foot track, descend 300 vertical feet, and accelerate around two lateral loops. Start off the new year with a winter escape at Lake Tahoe Resort Hotel.